The developer – this person/team has unique “white box” perspective and can therefore provide valuable input on how to maximize code path testing to ensure that all behavioral aspects of the program are tested. This includes not just “normal” behaviors, but also error handling and error recovery. Customer (or person playing role of customer) – the customer wants to know the program does what they need it to do, and that what the program does is accurate, safe, secure, easy to use, etc. 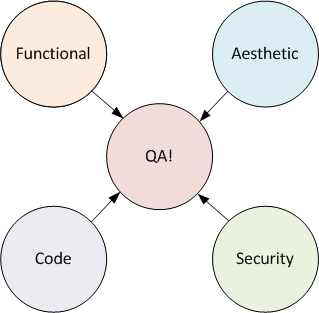 QA team – Does it meet the requirements? Does it handle problems (network outage, hardware failure, wrong inputs, etc)? Does it work on various hardware / OS versions? What is the hardware / OS / third party configuration matrix? These are tests that neither the developer nor the customer may be considering and evolve out of knowledge of other systems, and general experience. 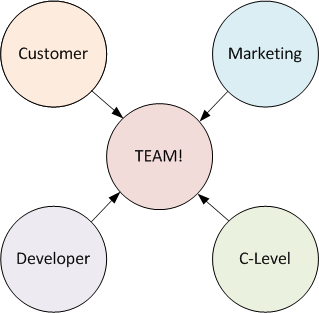 It can often be guided by issues that the developer encountered during development, and that the customer is aware of based on their specific domain knowledge. Customer – Is it intuitive to use? Does it work well with existing processes / workflows? Is it easy to learn? Marketing – Does it look good? Does it look better than the competition? Does it sell itself? Is the UI consistent in its look and feel – fonts, colors, layout, etc. Nobody wants an application that everyone hates using because it is awkward, creates more work, or is orthogonal to existing business processes. Marketing wants to make sure that the product meets or exceeds what the competition currently has, and first impressions are often a make/break point when the potential customer goes to your website and looks at a screenshot of the application. Is the application easily extensible? Are there exposed back doors? Is all sensitive data properly secured / encrypted? People come and go, applications must be constantly enhanced as new technologies appear and competition upgrades their own products. Again, this may be highly relevant to the product you’re developing, or barely relevant. Is the application protected from malicious attacks? Are the necessary roles implemented? Do the roles block functionality that a person with specific permissions should not have access to? Do the roles enable functionality that a person with specific permissions should have access to? These questions (and more) often fall outside of the application’s functional QA and are worthy of separate consideration. QA is all about inputs and outputs and the behaviors that occur, whether, for example, it’s simulating a denial of service attack or verifying that when the user clicks on the Cancel button, the UI returns to the home screen. Given some or all these documents, a formal Acceptance Test Plan (ATP) can be created. Creating an ATP is not trivial. It involves working as a team (including the customer if appropriate) in which different stake holders have different requirements for, ultimately, a pass/fail criteria. As a team, one should develop specific and formal approaches for testing. This can be complicated, especially when trying to determine quality in code, or creating the necessary test fixtures to simulate security issues, hardware failures, etc. Requirement can be orthogonal — the user wants a single click to create the wirelist for an entire satellite, but the application requires meticulous, accurate, and verified component, signal, and connector information. Ironically, the QA process itself needs to be QA’d. Once in the field, do problems occur that the QA process missed? Why? 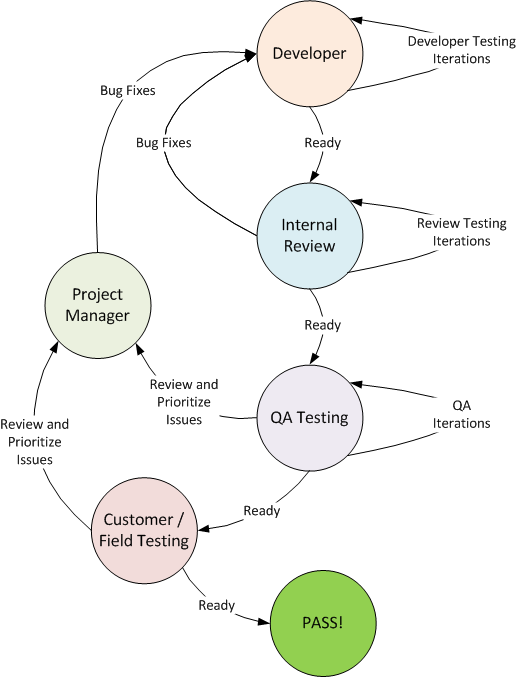 How can the QA process be improved? Try to anticipate this ahead of time, but realize that not everything can be anticipated ahead of time. Before the QA process formally begins, various pieces must be in place. Marketing can contribute look and feel requirements, ease of use, help documentation, etc. Keep it simple but comprehensive. Don’t get overwhelmed in the details, but decide what level of QA is appropriate for time, money, and staffing that is available. What other documents exist that can help guide and create the ATP? QA often needs to be able to peer into the application in ways the customer doesn’t care or need to know about. Can often be useful in figuring out what happened out in the field. What facilities do you provide QA for monitoring code exceptions? A formalized set of input parameters, workflows, and expected outputs is the cornerstone of the QA process. Reports – are the correct reports created and are they accurate? Can the workflows identified above be automated? What tools (both internal and COTS) need to be developed or acquired to aid in test automation? the developer report issues are fixed? the project manager prioritize issues? QA re-test and sign off on an issue? Project manager has the ability to prioritize issues, move issues to “next release”, and track what steps, and how long, it took to resolve an issue. not necessarily sequential – they can occur in parallel depending on relationships and involvement with customer, etc. do not need to occur when the application is completely ready. Specific areas of the application can be tested at any point, particularly when milestones are tied to deliverables. In this process, the developer can start creating the “white box” ATP. Before the application is handed over to QA, the developer/team does internal testing. Here is a good place to also do code QA. Any additional guidance to QA can be given here. Any additional aids (as discussed above, test fixtures, simulators, etc) can and should be determined here, if not earlier. Issues are found and fixed, or workarounds are accepted, or issues are agreed to be moved to “next release”. Limited field testing is often a useful step before releasing the application to everyone. Specific customers that are willing to be guinea pigs for new products, have a fallback system in place in case something goes horribly wrong, and can clearly communicate issues and provide useful feedback — well, those customers are like gold. While this article just scrapes the surface of a formal QA process, it is intended as an introduction of the high level planning and QA process, especially for teams that have no prior experience working on a “production” application, or for teams looking for ideas on how to improve currently very informal processes. Hopefully this gives you an idea or two!